Parc Architekten designed the Ischgl Cultural Center as an underground complex with a small square organized around different rooms for culture clubs. 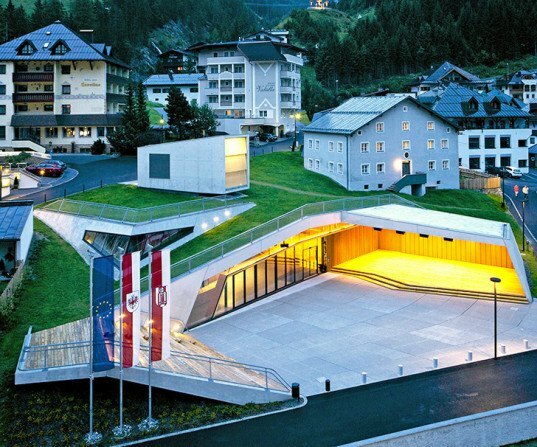 The center, located in one of the most important winter tourist destinations in Austria, is carved into a hillside, with single elements protruding and bringing natural lighting into the building. Visitors can use the small footpath that passes over the top of the center in their commute between the village square and the upper part of the village. The village center is a restored rectory that was built in 1763, and is meant to define the village identity and create a modern meeting place. It features a subterranean tunnel that allows access for the tourists between hotels and ski lifts, while on the surface, a small footpath connects the square with the upper part of the village. The square is located at the heart of the complex and includes an outside seating area. The structure was built mainly for the village music band, which is why the band practice room acts as the heart of the building. Angled walls provide better acoustic isolation, while the external wooden lattice structure creates a triangular geometry that dominates the site. The external music pavilion is located on the south side and features vertical wooden panels, which enhance its acoustics. 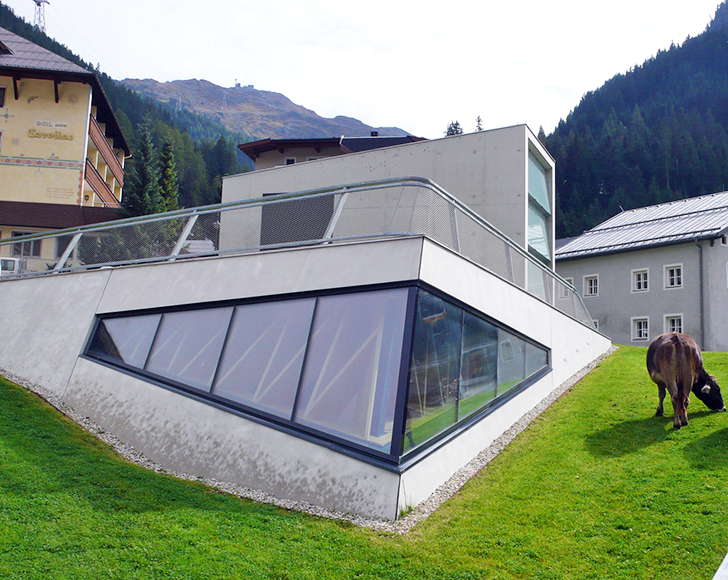 It features a tunnel that allows access for the tourists between hotels and ski lifts. Angled walls provide better acoustic isolation, while external wooden latice structure creates a triangular geometry that dominates the site. The village center is a restored 1763 rectory and is meant to define the village identity and create a modern meeting place. On the top, a small footpath connects the square with the upper part of the village. The square is located at the heart of the complex and includes an outside seating area. The structure was built mainly for the village music band, which is why the band practice room acts as the heart of the building.